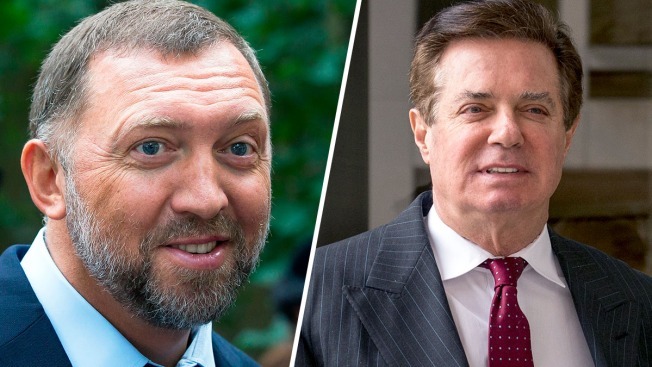 Russian oligarch Oleg Deripaska, left, has close ties to Vladimir Putin and once loaned $10 million to former Trump associate and campaign manager Paul Manafort, right, for a business, newly unsealed court records show. A search warrant application unsealed Wednesday revealed new links between one-time Trump presidential campaign manager Paul Manafort and a Russian oligarch with close ties to the Kremlin. In an affidavit attached to the application for a warrant allowing federal investigators to search one of Manafort's residences, an FBI agent said he had reviewed tax returns for a company controlled by Manafort and his wife that showed a $10 million loan from a Russian lender identified as Oleg Deripaska. FBI Special Counsel Robert Mueller has been investigating the financial links between Manafort and Deripaska, a metals magnate who is known to be close to Russian President Vladimir Putin. Deripaska was among the Russian oligarchs sanctioned by the U.S. in April. The July 2017 application to search Manafort's Virginia apartment was granted, NBC News reported, and provided key evidence that led to indictments of Manafort stemming from Mueller's ongoing probe into connections linking members of the Trump campaign team to Russian oligarchs and government officials who may have been involved in interfering with the 2016 U.S. election. Manafort has pleaded not guilty in Washington and Virginia on charges including conspiring to launder money, bank and tax fraud and failing to register as a foreign agent for the pro-Russia Ukraine government.